Somewhere in the unmapped regions of Kregen, beneath the two suns of Antares, lies the hidden city of the Savanti. The Savanti were responsible for tearing Dray Prescot away from his native Earth for their struggle against the Star Lords. Dray had long sought the locale of his original landing because it would help solve the mystery of his transition. Now the time has come when the search must be completed without delay, for the father of his beloved Delia is a victim of assassins, and only the Savanti can undo the evil that could shatter all that Dray holds dear in his second planetary homeland. 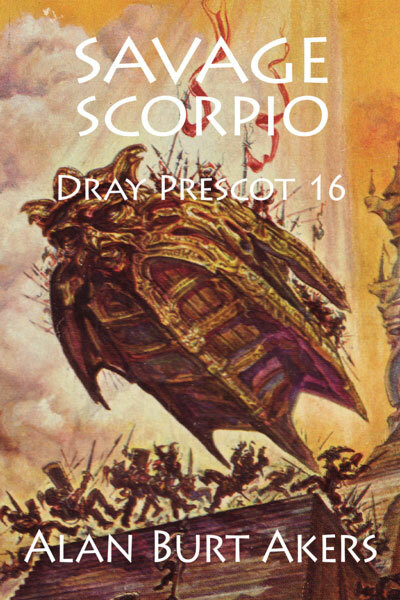 Savage Scorpio, the thrilling novel of a mission that would involve powerful forces far beyond all Prescot's personal desires, is the sixteenth book in the epic fifty-two book saga by Kenneth Bulmer, writing as Alan Burt Akers. The series continues with Captive Scorpio.